King's Resort is one of the best budget properties in Mumbai. Featuringan open- air restaurant, this hotel is 26 km from Chhatrapati ShivajiInternational Airport.This two-storied property has 24 spacious and well-maintained roomsfor accommodation. Each room is equipped with amenities like bottled drinkingwater, temperature control, wakeup call, wardrobes and attached bathroom withhot and cold running water. Facilities offered at King's Resort include front desk, roomservice, laundry, luggage storage, backup generator and doctor on call. Abusiness centre is also there for hosting corporate events like seminars andconferences.Guests can plan to visit Manori Beach (35 km), Gorai Beach (30 km)and Manor (65 km). This hotel is accessible from Mira Road Railway Station whichis 17 km and Sector 12 Nerul Road which is 28 km from this hotel. 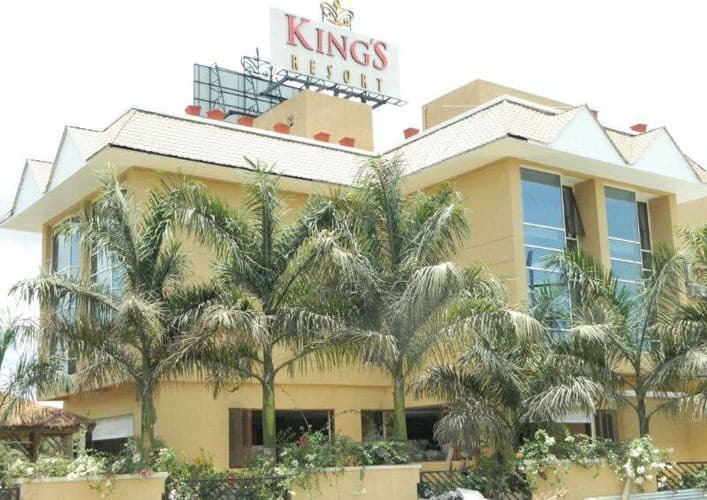 Featuring a garden and a restaurant, Kings Resort is located in Dhanbad. Among the various facilities of this property are a terrace and a shared lounge. The accommodation provides a 24-hour front desk, and buying tickets for guests. All rooms at the hotel are equipped with a seating area and a flat-screen TV. Kings Resort features certain units with garden views, and every room includes a kettle. At the accommodation, rooms have air conditioning and a private bathroom. Guests at Kings Resort can enjoy a continental or a a la carte breakfast.